"When Doctors meet, it's a laugh," Moffat tells RT. Capaldi's Doctor is mortified by his earlier self's old-fashioned (hilarious) attitudes, while Bradley's Doctor is unimpressed by his successor's sonic sunglasses and sepulchral Tardis (his own is re-created in its gleaming white 1960s glory). Twice upon a Time plays some sombre notes, too. Mark Gatiss is top-hole and rather touching as a British captain lifted out of a bomb crater in the Great War. Glass avatars from the future oblige the doddery Doctors to contemplate mortality and what it means to be good and evil. APA 6th ed. : Mulkern, Patrick (2017-12-23). Festive Farewell. Radio Times p. 122. MLA 7th ed. : Mulkern, Patrick. "Festive Farewell." Radio Times [add city] 2017-12-23, 122. Print. Turabian: Mulkern, Patrick. "Festive Farewell." 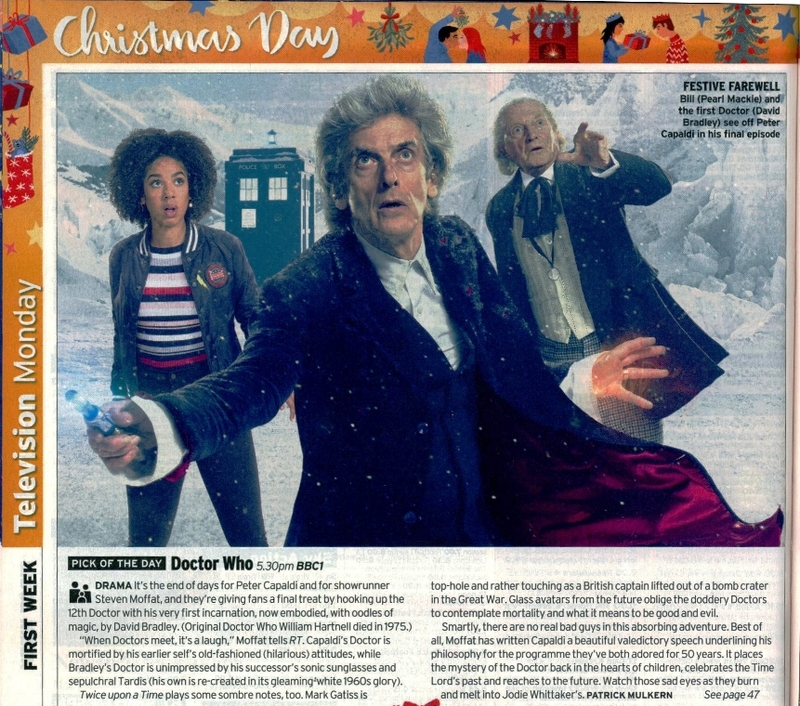 Radio Times, 2017-12-23, section, 122 edition.